For some odd reasons, Asian people have an insatiable appetite for animals. They kill dogs, elephants, bears, turtles, insects, mice and a host of other animals for food. The Chinese and Vietnamese take things to an even higher level, albeit a bit dangerously. They love to drink a special type of wine called snake wine. 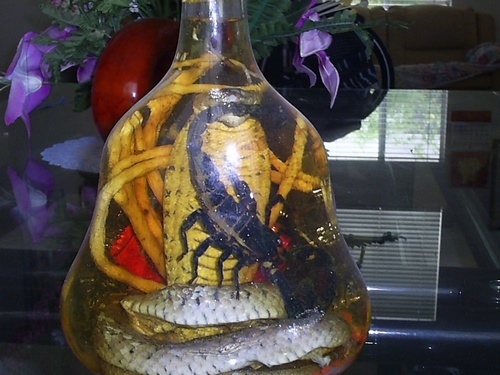 The main ingredients for this Asian specialty include wine made from rice, ginseng and deadly creatures such as venomous snakes (most likely cobras) and scorpions. 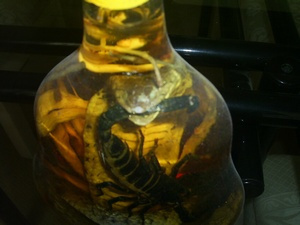 Drinking snake wine is traditionally believed to have many health benefits. 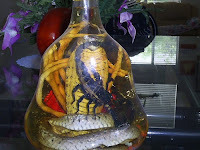 Snake wine also makes a good souvenir since the fermented creature is encased in the bottle. You can actually see the snake inside and it looks pretty alive. There have been unconfirmed reports of snakes surviving the fermentation. When the patrons opened the wine bottles, the snakes sprang out and bit them. Importation of snake wine is banned in a number of countries because some cobras are classified as endangered species.